Food was delicious and our server was amazing! Very expensive for ordinary entree of Chicken Marsala. Did not like bread or salad. Needs to up game. I loved how I felt welcomed from the moment me and and my boyfriend walked in. Excellent service, our drinks and food were amazing. The environment was very calm and perfect for a date night. I will definitely be returning again. My husband and I went to the restaurant for the first time on Valentine’s Day. The only reason I have a 3 star in the value is because the flavor of the food and presentation was great, but the portions were way too small for the price. I had the surf and turf. My plate came with 2 small scallops, 2 small shrimp and with a less than a 4oz filet minion. The value was not there. I’m not sure if I will go back. I don’t mind paying a high price but the portions should be bigger than was served. After the experience, I question if even more expensive dishes such as the four course dinner offered on that day were the same on the portions. I’m not sure if it was because the restaurant was very busy, it affected the portions too. It is a wonderful place for a night out with that special someone. 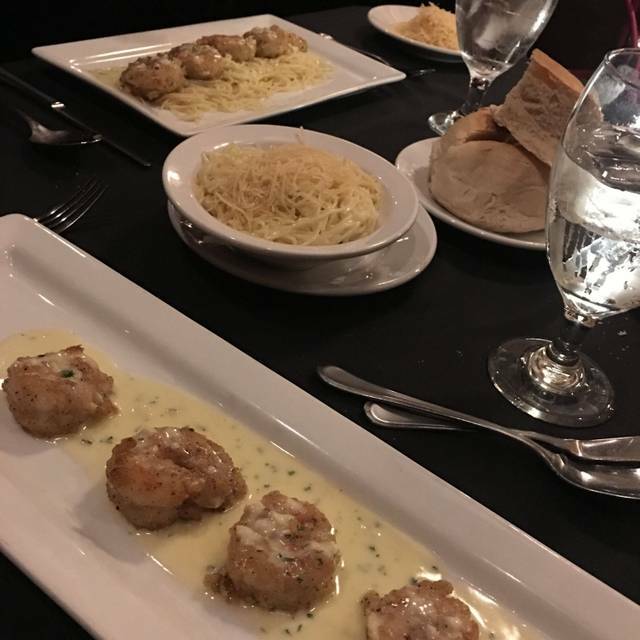 The food was incredibly delicious, the servers were courteous, and there were many happy people dining at Scuzzi’s. To note, it is very casual which is excellent for families but may not be the exact amount of formality some may expect at a seemingly traditional Italian restaurant. Fixed menu for Valentine’s Day—not a big selection of choices—low quality chicken & fish selections—lack of flavor masked by too much salt—nice waiter but he was unsophisticated & lacked culinary knowledge—thinking they hired fill in waitstaff on the fly to handle the V-day crowd—bad lighting & noisy atmosphere for an intimate dinner. This was our fifth or sixth time in Scuzzi's and it has been extremely enjoyable each time. I can honestly say you get what you pay for. The food was excellent as well as the service. If you like or should I say love Italian, Scuzzi's is the place to go. The meal was outstanding as was the service. Good table conservation was attained without undue disturbance. There was a very strong air freshener smell that was emitted periodically while dining. The air freshener belonged in the bathroom not the main dining area. It was very unappetizing. Upon visiting the bathroom it was apparent the restaurant has some sewer issues which was perhaps the reason for the air fresher in the dining area. Would not dine there again by choice. Experienced and excellent New Year's eve dinner with family. This was for New Year's Eve dinner with friends. We were placed in a rectangular shaped table(s) in the back corner of the second room. Not great! I prefer 4 so you can visit easily. And the noise level Monday night was such that I would have had to YELL to diagonally across table friend to talk! So I talked very little, really. The food and service were great as usual. My husband and I come to Scuzzi's for special occasions for dinner. I've been coming here for 7 years now for lunch with organizations and friend groups. So it has been one of our faves for many years now. Thank you for the continued consistently great food. YUM! I am a walking advertisement for your shop. Keep up the good work, please. Not that many "nice" restaurants that have great food and service. I have eaten the sea bass before and will again. The creme brûlée was runny. I will not order again or recommend it to others. Fabulous dinner on New Years Eve. Service was fantastic and food was properly portioned. It was not an overwhelming amount of food that would necessitate to go boxes. It was just perfect and worth every penny. We have been driving by for years and finally decided to stop in. The service is very attentive and our meal flowed smoothly from drinks and apps all the way through to dessert. The food was excellent. Our table ordered a variety from the linguine with clam sauce to the ribeye. All well prepared and very flavorful. The restaurant itself is a comfortable little spot. Not overly fancy but still inviting. To be honest, I was very disappointed at the noise level being so loud. We were celebrating two of my daughters’ college graduation and I wanted a venue to be able to make a toast and still be heard by my guests. For whatever reason, the restaurant didn’t place us in their private dining room. Luckily, we made a later reservation and some of the other restaurant guests started leaving causing the ambient noise to drop considerably. Now that the negative comments are out of the way, I would like to say the service provided by our server (Farver?) was outstanding. He was so very attentive to our large table and we were never lacking in anything. He was spot on with serving our drinks and our sparkling wine for the toast. The food was very good and was served hot and fresh. I will confidently say the server and the chefs, of course, saved the evening! Staff was friendly and professional. They made last minute adjustments to accommodate an increase in our reservation. Our server, Amanda, was attentive. We appreciate the variety offered on the lunch menu. Everyone in our party was pleased with the quality of the food. Everything was fine, with the exception of to much salt in the food. Dinner with my mom and it could not have been more perfect. Our server Ricardo was attentive, cheerful, and had perfect timing. It had been a while since we have been to Scuzzi’s due to noise level, so I was surprised to see the remodel and thankful that it reallly seemed to helped with the noise. Thank you, Ricardo and Happy Thanksgiving to everyone. bday dinner, 6 of us. Service very good and efficient. Wine great value on Tuesday nights. All food was very good. Good food. Good value. Excellent service. Staff are knowledgeable and courteous. North central location with plenty of parking. From drinks at the bar to finishing our meal, everything was outstanding. This was the perfect place for a date night. My boyfriend and I will definitely be back. 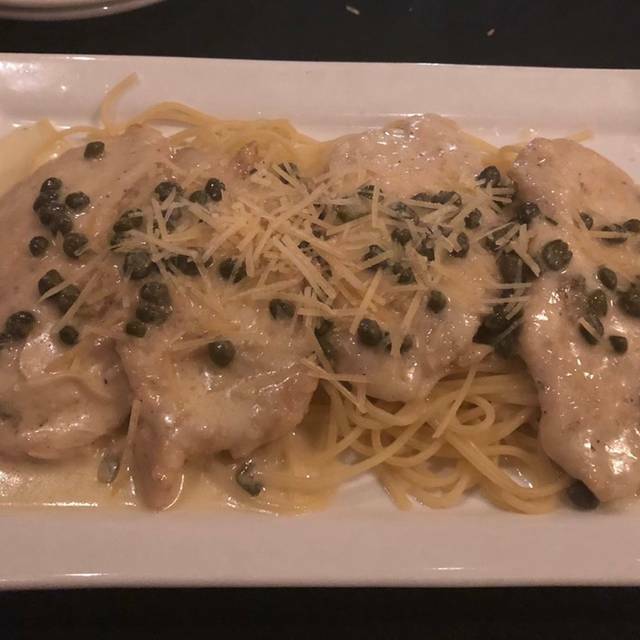 The chicken piccata and rainbow trout were so very good. Always a very pleasant dining experience. Thank you for another great evening. The food was wonderful and Russell our waiter was great. Very knowledgeable about the chef specials and recommended a great entree. Outstanding in every way! We really enjoyed our evening at Scuzzi’s. We will return very soon. Great menu and food was excellent. Service was good and we enjoyed the evening. Wife had the tuna appetizer as a main course and it was outstanding. As always, Scuzzi's is a "go to" place for date night. Good food and drink, good prices and service with a smile. My 5-star rating! The food was excellent. Each one of our party of four had a different meal, and everyone loved their dish. Portions were generous, but not wildly so. The wine was good, and the bloody mary that my wife had before dinner was excellent. Our service could have been better. When we first arrived, the bartender was "on a break" so we waited about 10 minutes for our drink order to be taken. During dinner, our server seemed to be new, and struggling with the ordering system, and the wait to get our bill at the end of the evening was longer than I would have anticipated. The light level was adjusted in the middle of our meal, and they made it darker in the restaurant than I would have preferred. At the end of our meal, many more tables were filled, and the noise level was higher than it should have been, they should really try to dampen the sounds.